Being in love has got to be one of the most amazing feelings ever…next to seeing your newborn son or daughter for the first time after labor (so I hear). That “in love” feeling is also amazing when you are loved back. Well…now knowing what love is, I also know what love is not. I’m not an authority on the subject, but the heart will never lie to you. Love should never make you feel fear. Love should not feel like a “chore”. Love should not be extremely hard or feel tough. Love should never make you feel as though you are alone. If someone loves you, you should never feel as though they just “don’t care”. Love should never place you in a state of confusion. Love never fails; if it’s hurting you, then it isn’t love. Love should never feel as though it isn’t supportive; love IS an anchor and something that grounds you, holding you steady in the midst of ANYTHING. I won’t part my lips to say I Love You and not mean it…that’s the problem though; people say it, knowing full well that it’s empty and FAR from sincere. Your best bet? Pray before you commit yourself to someone. Let God order your steps in a new or even a more seasoned relationship! You can even get better footing w someone if you have fallen off track, yet you all are on the same page, and willing to work at the relationship. Do the work BEFORE things go sour (if they ever do). Just make sure that you know that “flowers, bells, whistles, and candy” ALL of the time is not real. There will be disagreements, heated discussions, anger, etc., but love has the extreme and undeniable power to conquer any of those things. Just have enough sense to keep an open mind. Take my poll and let me know if you agree w this post! 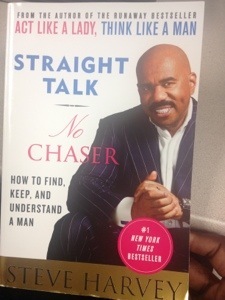 Author Steve Harvey is not necessarily “liked” by many, as it relates to his advice on relationships…I actually like him, and I agree w quite a bit of what he discusses in this book and in “Act Like A Lady, Think Like A Man”. 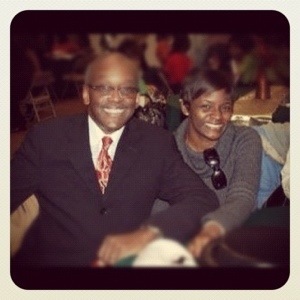 My Father, bless his HUGE heart, is the BEST MAN IN THE WORLD to me; a modern-day Superman! He has made it so that I don’t ever have to want or need for anything! Because he was (and still is) very active in my life, I understand that I deserve the very best that a man has to offer. My Father has ALWAYS given me his best, even when I didn’t want to hear what he had to say on certain topics; but that didn’t stop him from being the best Daddy to me…I salute him and how he has been very crucial in how I handle men. BECAUSE OF HIS INFLUENCE, I can smell the proverbial bullsh*t miles away. Steve Harvey hits on SEVERAL points about how to deal w men and how to get what you would like out of men (i.e. commitments , honesty, etc, not referring to tangible items–please…), but one thing that he will state, and states OFTEN is the fact that if you aren’t getting what you desire out of your relationship/if you feel that it is going nowhere/if he won’t commit, LET HIM GO. I love how he refuses to sugar coat a situation w his female audience…and for some, it’s just what we need to hear/read. What you want HONESTLY is that commitment; so why settle by merely accepting gifts that only pacify you for the moment? It’s easier to manuever through these situations w men when you KNOW YOUR OWN PERSONAL VALUE. It’s only a problem when you have no clue as to who you actually are and what YOU actually want. I know what I want and I won’t settle for less than I deserve; I have my Father to thank for that! 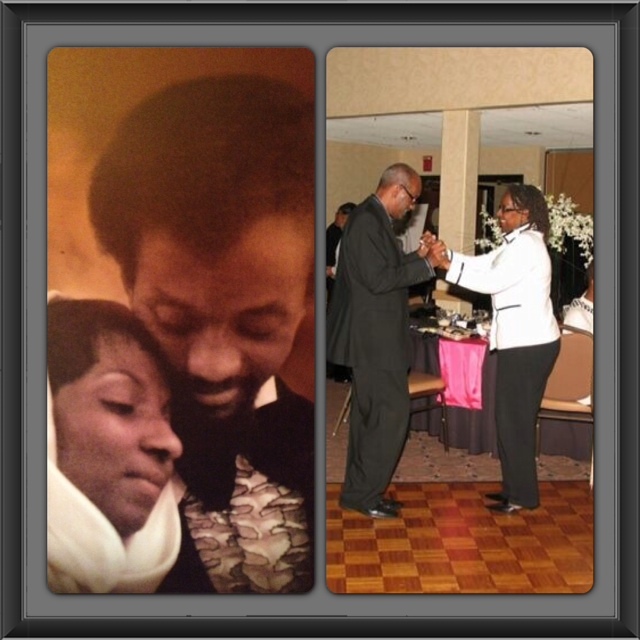 My Mother (may her soul rest in heavenly peace) was married to a KING (my Daddy); she encouraged him, supported his vision(s), and stood by him. Also, my Dad knew he was blessed with a Queen–and he treated her as such! A woman who encourages her significant other and supports him will ultimately make a man “want” to change his ways FOR HER! You can’t “change a man”, but you can be so phenomenal that he commits to making changes on his own…KNOW THE DIFFERENCE! There is no textbook method in getting to know someone, however you have to truly evaluate and sometimes RE-evaluate your situation on a regular basis. Are you getting what you want? Or are you getting what you accept? I’m hoping you know the difference…trust me; the men ALREADY KNOW THE GAME; we have to “navigate the plays”, ladies! Now…we all have rough times w life, people, jobs, etc. ; I just don’t personally want to be subjected to you–the one who doesn’t yet have a handle on how to keep it moving–on a daily basis. Some ppl get muted; some get deleted; some just get all the way blocked. I will be the FIRST to admit that I have my struggles, my tears fall, and my mood will shift. I just don’t want to be known as a “complainer”…so a lot of things are kept “in house”, if you will. Aaaaaaaaand, the vast majority of my personal life is simply none of anyone’s business. The face shown here, is highly indicative of my daily mood…even tempered. I’m more or less just glad to see another day! Buuuuuut I’m genuinely “happy”. I have chosen a happier side of life, even in the midst of a ridiculous moment! I keep pushing until my hardest moments are only a fraction of who I am. Eeeeeeeven in the loss of my Mother, I #chose to be thankful that her pain was gone. I simply choose joy. ELLE’S RESPONSE: You are going to have to stop putting unnecessary pressure on yourself as it relates to this relationship. No one told you to do everything…#YOU told you to do everything. Why not suggest to him that he should plan the next outing; don’t ask him what you all are going to do; just let him plan the entire date. He has to be made to feel that he is contributing to the relationship as well; if you do everything, he will never do ANYTHING. Also, show him how to treat you w your actions vs always having “super serious” conversations. The first thing you must do is take it ONE DAY AT A TIME. I could see if you all have been together for 6yrs or so…it’s only been a few months. You have to relax and have patience w him. He’s been hurt before, and in all honesty, it appears that he’s waiting on you to give up on him, because someone “giving up” may be what he’s accustomed to! Let him be involved in the relationship; of course you feel alone because you do EVERYTHING. He may be slightly discouraged to try his ideas out because you’ve made every decision. A relationship is about compromise; a man is a natural leader, so let him take the lead w things! However, even w that, a man has to realize that you aren’t like his past relationships…and if he’s been hurt, that takes a lil time and building trust. Give this time to flourish before you give up on what could very well be the relationship you’ve waited for! I have had to make some major decisions in the past year (and an even larger decision will be made in the coming months). But the biggest decision that I have made–outside of starting PRbyELLE77–was to give my heart to another person…who appears to be the #right person. …let you in on how good I feel. Whenever I sit alone, I’m nestled by this feeling. I wake up in the morning smiling because of something I remember hearing. I can’t explain why it can stop me dead in my tracks and make me forget EVERYTHING I may have been doing. I cry because of it; I laugh because of it; I sing because of it; I LIVE because of it. My life has not been the same since I’ve been able to feel like this. I think to myself “I’m so INTO you”…and that warms my heart in such a way, just to even say it. I sometimes sit in my car and the feeling rushes over me instantly. I feel it even when I’m in the salon, on a plane, reading a book, watching Good Times, or even about to get my rest for the evening. It’s just CONSUMING, overwhelming, weakening…it won’t let go of me, and I’m not letting go of it. I wrestle w it because it feels so good. Something that feels THIS GOOD should really be a crime. Only God could make something so beautiful…and I’m unashamedly and apologetically addicted. It’s like pieces of me are in the stars, and my epiphany?…is knowing that I’m soooooo gone. It’s soothing during a summer rain, it’s comfort when it’s cold outside, and I absolutely goooootta have it. I don’t really dig sports all THAT much, so this isn’t a blog about any recent injuries (prayers out to those who are dealing w injuries though…). I’m talking about the injuries we have that either life has provided, or the ones we give ourselves. Yep…even you are injured. DISCLAIMER: I am in NO WAY looking for any sympathy; however the world needs to know that not ALL injuries are PHYSICAL in nature. What about the person in your life, whether it be friends/family members/WHOEVER, who is truly “no good”? Not all relationships that are bad for us will be the boyfriend/girlfriend type stuff…think about the “toxins” that you allow into your space…if someone is always “slick” jabbing you, but always ending it w a “just kidding”…watch out. SOME of those people are genuinely your peeps, and are just kidding…but there are those who will secretly seek to sabotage your success. Your circle should be small; the circle of people who you share your dreams/goals w should be EVEN SMALLER. Keeping “toxins” around you due to feelings of obligation, or because you have history w them? SELF-INFLICTED WOUNDS. There is no logical reason that a person who brings about harm and discord should be allowed to remain in your space. Their constant presence only reopens or KEEPS open your own SELF-INFLICTED WOUND…don’t you love yourself? Sooooo pouring salt into a paper cut, for example, actually “feels good” to you? Ha! I don’t knooooooooooooooow…if you constantly reflected on WHO is in your circle, and what they bring to your life, you’d have to honestly ask “is this to my benefit or detriment?”. It’s really time out for assuming that certain affiliations will bring about perfect relationships; stop buying proverbial “band-aids”; you’re “wasting money”, and your self-inflicted wound will never heal, because you cause the pain to “self”. Life’s injuries don’t have to kill you; just care enough about yourself to understand that some things just aren’t your fault. Some injuries are unavoidable…what are you doing about the ones that ARE?